"I always knew I would die in an elevator!" Unstuck has debuted a trailer for Christmas Eve, a comedy about six different groups of people stuck in six different elevators in New York City after a power outage knocks them out. Patrick Stewart is in one of them that's actually at a construction site, though the film is really an ensemble piece, featuring a pretty big cast. Mainly starring Jon Heder, James Roday, Cheryl Hines, Max Casella, Julianna Guill, Shawn King, Gary Cole and Christina Chong. Besides being funny, this is one of those feel good movies where you're supposed to learn something about life, perhaps change a little, so there's a lot going on. But six elevators all at once? Should be interesting. Give it a look. When a power outage traps six different groups of New Yorkers inside elevators on Christmas Eve, they find that laughter, romance, and a little holiday magic will get them through—and change their lives in unexpected ways. 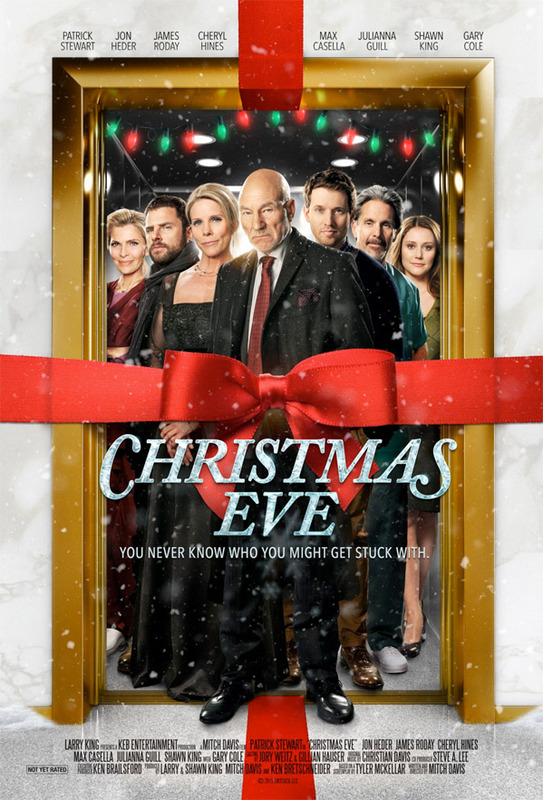 Starring Patrick Stewart, Jon Heder, James Roday, Cheryl Hines, Max Casella, Julianna Guill, Shawn King, Gary Cole Christmas Eve is directed by filmmaker Mitch Davis (of The Other Side of Heaven, A House Divided previously), from a screenplay by Mitch Davis and Tyler McKellar. This has not premiered at any film fests. Unstuck will open Christmas Eve in theaters starting December 4th this fall. Stewart is having so much fun in this his late-career.